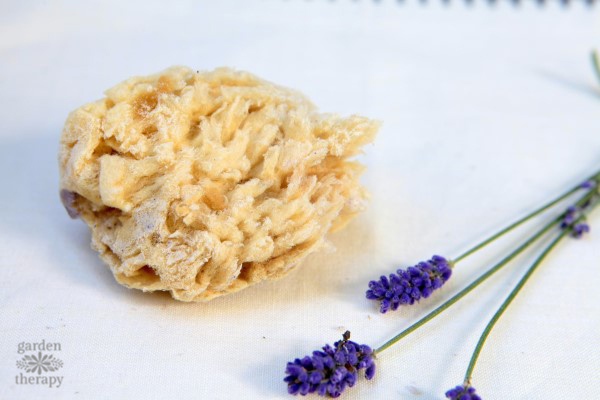 Organic-looking handmade soap topped with natural sea sponges makes for a gorgeous soap that lathers up beautifully. Sea sponges are a natural, biodegradable alternative to synthetic sponges and they are gentler on skin. The last time I made soap, I set aside one of the batches to pour into silicone molds with sea sponges. There are over 5,000 varieties of sea sponge, only a few of which are harvested for commercial use. Sea sponge varieties range in size from less than 1 inch to 6 feet long! The soft, squeezable objects that we recognize as sea sponges are actually the soft inner part of the sea sponge. In nature, they are covered with a hard protective layer. fully cut them at least an inch from the base. This allows the sponge to regenerate after being harvested, and in fact it will come back larger and healthier than before it was harvested. There is no need for concerns about sustainability when it comes to the harvest of seas sponges, as the process actually encourages healthy regrowth and increases population density. Sea sponges are not just useful to people, dolphins use them too! Dolphins have been known to carry sea sponges in their beaks while looking for food along the ocean floor. The sponges act as a combination filter/shield which protects the dolphin from sharp rocks, urchins, and other objects that could hurt them. 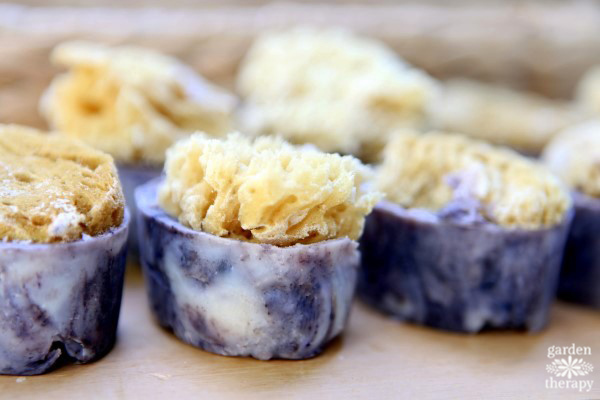 Topping bars of soap with sea sponges makes for nice gifts. 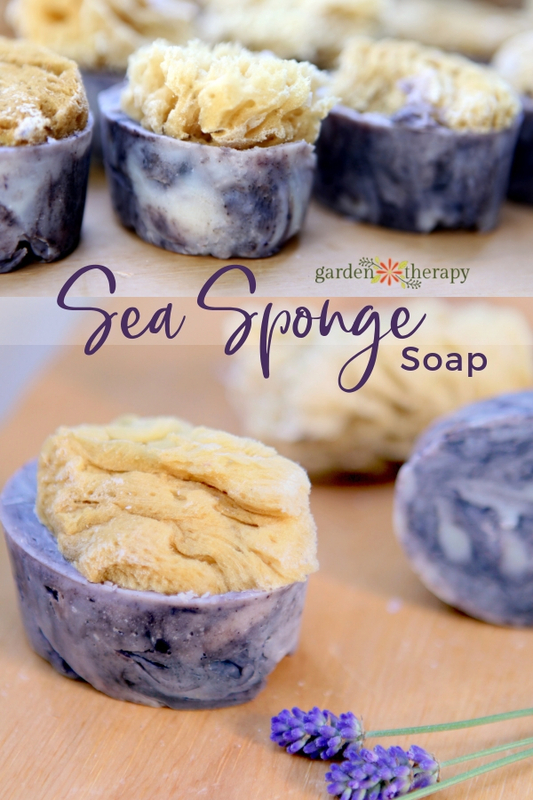 Be sure to make plenty and keep a few bars for yourself as the sponges create a luxurious lather that is heavenly to wash with! 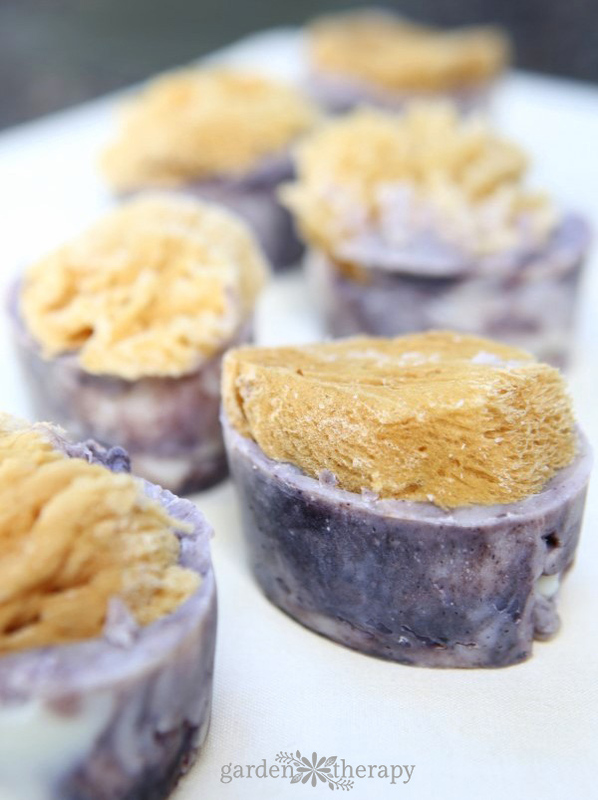 You can make sea sponge soap with either cold process handmade soap or melt and pour soap. For the soap shown in this project, I scented it with lavender essential oil and colored with swirls of ratanjot. 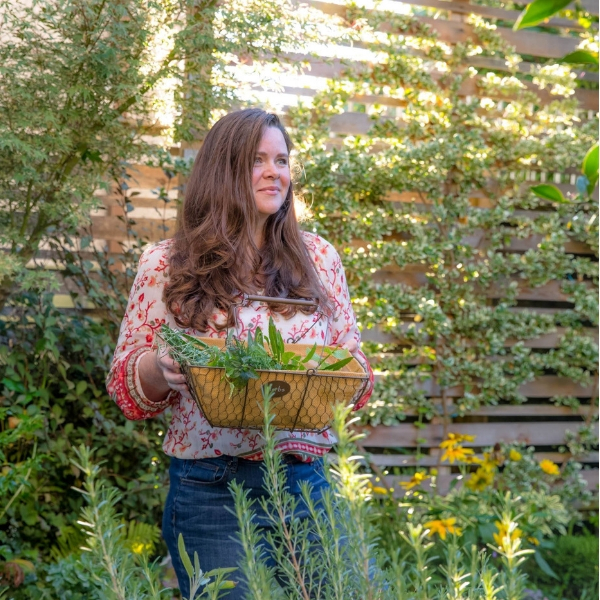 Use the instructions in these posts to figure out which is the best method for you. 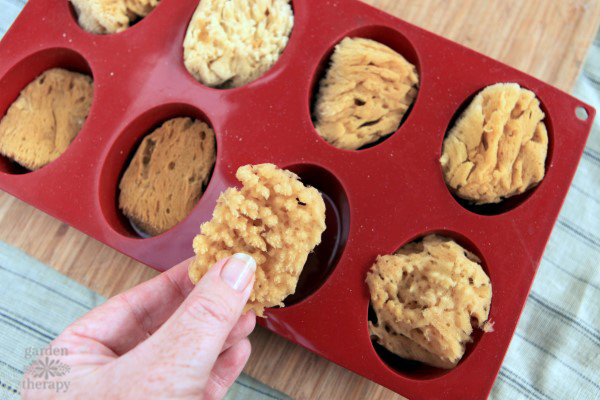 Once you have your batch of soap ready, you’re going to add it to a silicone soap mold and top each one with a sea sponge. It’s best to cut your sea sponges to size before you make your soap. Adding the sea sponges has to be done very quickly as the soap sets quite fast once it hits the mold. Pour the soap into each cup, leaving at least a quarter inch of headspace in each one, then gently press your sea sponge into the soap so that it sinks in and attaches. 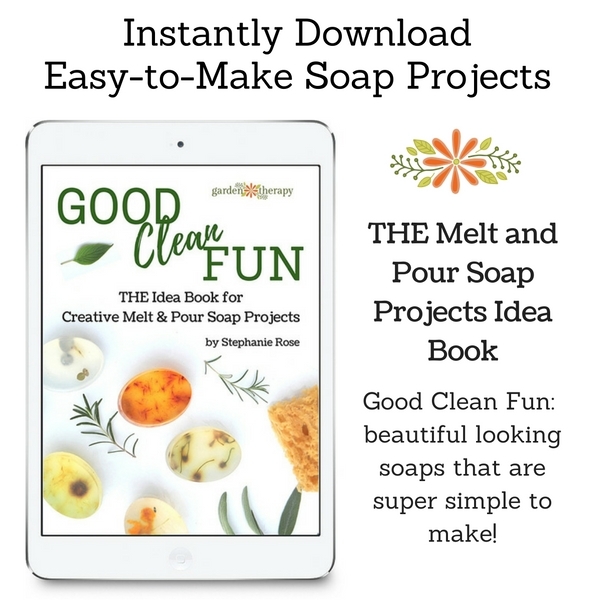 Allow the soap to cure until it’s ready to be removed from the mold (by following the instructions in the soap tutorial you are following). 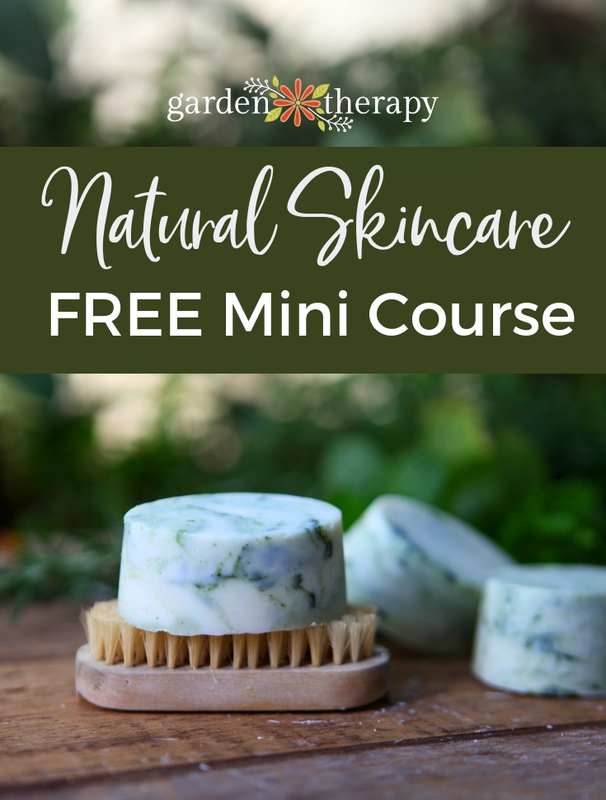 When the soap is ready to be unmolded, it can be wrapped up and given away as gifts, or lathered up as a luxurious treat for your own shower or bath. 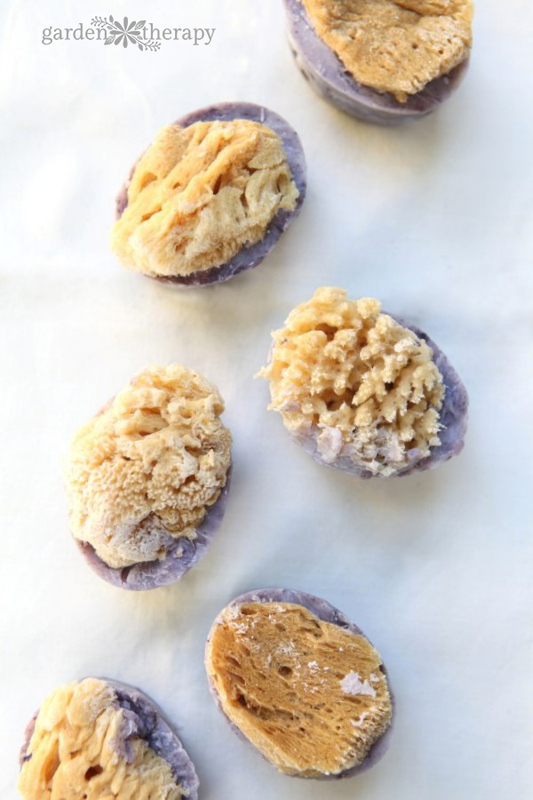 Where do I find sea sponges to make soap that are affordable? Hi Angie, the link in the materials list shows 12 sea sponges for $10: https://amzn.to/2gmv5f0. I think that is pretty good, but you can also look at craft stores and Etsy. Hi ! How do you do to swirl ? Hi Melanie, at trace, I mix the powdered colour (ratanjot) with the soap at the edge of the bowl then use the spatula to pull the colour through just three times. Then pour into the moulds. Have fun!